Paul and Wendi Gilbert are the Executive Producers of Heart at Work Productions. Together, they have over 40 years worth of experience in film, video and digital media. 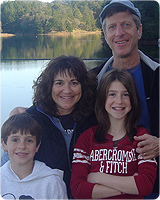 Paul and Wendi are the proud parents of Samantha and Joshua, whom they consider to be their finest productions to date. As the parents of two children, we know first hand the challenges new parents face with babies and sleep. With our first baby, Samantha (aka the Sleep Havoc Specialist), we suffered from sleep deprivation for over a year, during which we were often cranky and tired, and at times, completely exhausted and overwhelmed. This was when we recognized just how much a lack of sleep affects a parent's ability to function. Much to our surprise, we discovered a serious dearth of resources, or we should say balanced resources. The subject of infant sleep doesn't get much attention in prenatal education and, for new parents looking to find information on their own, one book would insist its way was best, while another argued another method was superior. On top of that, there was pressure from other parents and societal conventions to train our baby a certain way. We also discovered that sleep education is not a part of a pediatrician's educational training so many parents with infant sleep issues don't know where to turn. Thus, we decided to utilize our skills as video producers to find the most important and relevant information and get it out to other new families. We thought to ourselves; wouldn't it be great to create something that addressed the issues expectant parents should know before their baby comes, and more urgently, to answer the questions new parents would have during those demanding first weeks and months? We set out to create a video that would be informative, objective and non-judgmental, something that didn't exist in the marketplace. The response we received to the first edition of Sleep Like A Baby was fantastic! Winning a coveted Parent's Choice Award, a Kid's First! Award and an endorsement from the National Council on Family Relations, showed us that people were hungry for and receptive to a well-informed work on infant sleep. Now, in this just-released edition we've completely revised and updated the program, included new information and advice from infant sleep experts and focused on the latest safety information, including safety guidelines from the American Academy of Pediatrics on the prevention of Sudden Infant Death Syndrome (SIDS). Much as the process of creating the first version of this program was like having a baby, we've now given birth to our second child with this updated version that features new material, additional sleep experts and a focus on sleep safety. Producing it was a labor of love all over again, but this time, as veterans of the infant sleep world, we brought the experience, wisdom and calm that comes the second time around. We are extremely excited to re-release Sleep Like A Baby to a whole new set of new and expectant parents as you head into your parenting journey! Paul Gilbert has worked as a writer/producer for the NBA and CNN and has been published in Newsweek, New York Times and Psychology Today. Wendi Gilbert was a VP and senior producer at Oglivy & Mather Advertising and is currently the Managing Director of the Life Balance Institute in Tiburon, California.